Well La De Da - Gone! Last night while watching the 6:00 news, I found out that the antique/shabby chic house that I absolutely love is gone! Gone as in a fire completely distroyed this wonderful home like setting with a combination of antique and shabby chic items. Ashley and I stopped by two weeks ago and looked around and I said that I should take some pictures but I said, "next time I will." "Well La De Da" was an antique business created by four women and they were about to celebrate their six year anniversary. 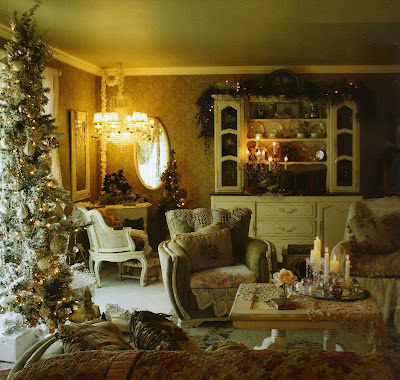 The antique shop resided in a couple of locations until they found this big, old house and made it their antique home. The roof and second floor collapsed from fire, and because it spread so quickly the store was a total loss. One of the gals had just brought in the most fabulous antique bedroom set ever. She had completely re-done it. She just got it in the store and just about as fast as she got it in, it sold, but the girl put it on layaway and now it's gone! Crystal is here this weekend and put them together for me. Let me know what you think, I think they are so cute! And leftovers! I love Peeps! Welcome to Foodie Friday hosted by Designs by Gollum every Friday. Today I'd like to share a recipe that is always a hit at work when we have a potluck or goodie day! It's usually gone in a couple of hours and doesn't take a lot of time or ingredients. Let loaf of bread rise. Spread dough out on cookie sheet. Baste with part of one egg. Layer pepperoni over rectangular dough. Layer provolone slices on top of pepperoni and then layer the Mozzarella cheese. Sprinkle with Parmesan cheese. Roll up the dough jelly roll style, sealing it. Secure the ends by squeezing the dough so the filling won't ooze out. Baste with rest of egg. Bake 350 degrees for 20-25 minutes or until golden brown. 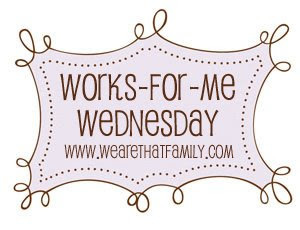 It's Wednesday and it's time for Works For Me Wednesday hosted by We Are That Family. I've been spending quite a bit of time organizing various areas in my kitchen and it seems it seems that the kitchen counter is the dumping ground for mail and it was taking over. I happen to follow the blog - Virtually Organized by Debbie and received a newsletter last weekend. 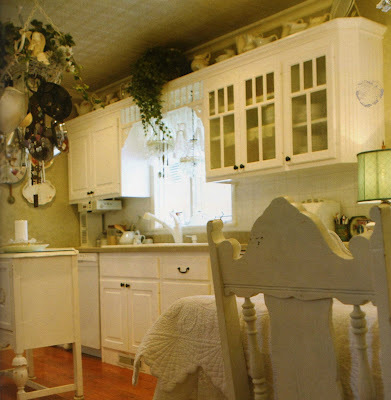 The newsletter peaked my curiosity about maximizing your kitchen cabinets and controlling clutter. I encourage everyone to check out her site because she has several weblogs on Fox 43.com. Here's some pictures of the mail and paper in the kitchen that is really out of control.. This truly was the kitchen counter, I really thought I was an organized person until I saw what this looked like.. I took everything and made stacks of what to keep and what was trash(more trash than good stuff here). Anybody want the holder that I had on the refrigerator? It's not going to be needed anymore.. This definitely works for me! Today is another one of my unpaid days off from work and so it's unsaid that I'll head to Goodwill and see what they have. So here's what I found.. This yellow lamp, I couldn't pass up.. I didn't notice until now that the TV was on HGTV..I love that channel! I wasn't ready to head back home, so I headed over to the other Goodwill and see what they had. And boy, was I glad I did. I found this white tureen for $3! This cute coffee cup to take to work..
Gilmore, my kitty, was smelling all over the box. I'd put him on the floor and he'd jump back up - so he's in the picture.. Tomorrow it's back to the grindstone...tomorrow I'll show you what else I did today! 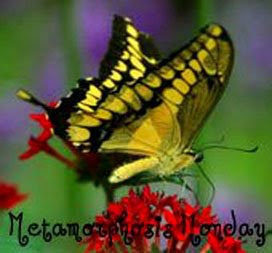 Welcome again to a Metamorphis Monday at Between Naps On The Porch and also to Thrifty Decor Chick and her Spray Paint Party. Make sure to check out both sites to see what others have been busy with. I've got a few projects going on this weekend. First I did a lot of thrift shopping on Saturday not to mention during the week with spray painting and moving things around. I didn't really like them as white so I used a metal spray paint that I liked much more so. Now I'll be on the hunt to fill that wall! My DH ended up doing most of the work for the next project. At the top of the steps we've had a Terry Redlin picture for 10 years(not in this spot but throughout the house) and yesterday I bought a wall decal. This was not an easy project, the walls are really textured and it took quite a bit of time. But the end result looks darn good - now I just need to add some pictures to the frames. Has anybody else had trouble putting these decals on the walls? I want to do more but if it's this hard, this might be the only one that goes up. But then because I've got too many things going on at the same time...I've been working on my office....and I found this set of three turquoise metal pots with tray at Goodwill. Although the color isn't bad, I knew this would be a white spray paint project and it turned out really cute! I spray painted them white and added some cute decals. I'm not sure that I like to decals but for now it works. I'm going to use this to store, pens, makers & scissors. So many projects and so litte time! Please ezxcuse if I have typos or grammar mistakes, I am so tired...but I got a lot of stuff done this weekend..oh and DH was sure a great helper, and he's a keeper..
Today the weather was beautiful, now only was the sun out and the wind wasn't blowing at 25 MPH, it's Saturday and time to go visit my favorite Goodwill Store. This morning I got there at 9:10 am and the parking lot was already full! As soon as I walked in the door, my plan was to see if the bird lamp was there and I got sidetracked when I saw a old croquet set and I snatched it up and asked them to set it aside for me while I looked around. I don't have a picture, it's in the garage and DH's truck is parked right up to it. It's really dirty but it's a great find! I'm happy to say that the bird lamp was there and I grabbed it and put it in my shopping cart - I have big plans for this find and it does involve spray paint and a new shade because the shade is really dirty...ewww! This time I spent a lot of time looking at clothes today. I seem to go through clothing phases where I wear alot of pink and then red and then blue or I like turtlenecks and then long sleeve button up shirts. I wear a lot of twin sets for work but my weekend wardrobe is lacking so today I found a couple of sweaters and a zip up sweat jacket and a purse! and this cheese tray to give to my daughter. Crystal - do you like the tray? Time to visit Hobby Lobby to find some supplies for a spray paint project that I've been working on. 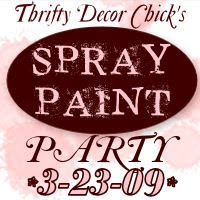 Thrifty Decor Chick is having a spray paint party on Monday, the 23rd. Make sure you check out all the great ideas and how creative people can be with spray paint! And now I'd like to share with you a family favorite that I make quite often, it's Spaghetti Pie. I usually make a double recipe so that we have leftovers - always better the second time around. The only thing I did wrong this time was, I didn't have tomato paste so I used diced tomatoes - it's very important to use tomato paste - you can use more water than the recipe calls for but use tomato paste. Pour into a greased 9" round pan and form into a crust. Cover with foil and bake at 350 degrees for 30 minutes. Top with shredded mozz cheese and put back in over for 10 minutes or until cheese is melted. And I had a little helper - Gilmore - the counter is his favorite place to sleep..
Biker Dog Storm - Dogs on Thursday! OMG - FACEinHOLE - Love it!